Friday night was a special night at the Royal Albert Hall. 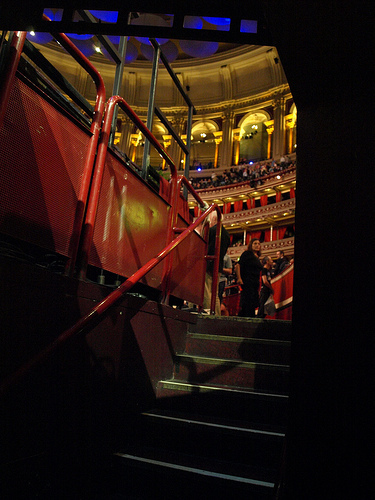 In addition to the very real sense of excitement present on any Friday night gig, Prom 40 had the added benefit of sporting a very long promming queue and a packed auditorium – it’s always special when the Albert Hall is full for a Prom. The capacity audience may have had something to do with the presence of Pierre Boulez. I knew of Boulez from seemingly interminable music history lectures at college and hours spent in the library trying to get my head around why it was that the music he had composed which I found so impenetrable was so important to 20th century compositional technique. I understand it now, obviously, but back then I wanted Boulez’ music to be more like Beethoven’s. It goes without saying I was spectacularly missing the point about Boulez when I was studying for my degree. One of the prommers agreed with me in the bar pre-concert that it was undoubtedly the opportunity to see the 82 year old Boulez conduct the BBC Symph again which had attracted so many people to come on this particular evening. She also went some way to reassure me that contrary to the conclusion I had already jumped to, I would enjoy Janacek’s Sinfonietta. She was absolutely right. The opening brass sequence was instantly recognisable and provided the perfect hook for me to discover some of the more unfamiliar parts of the work. Being on the second row also helped introduce me to some marvellous musical textures throughout the work, something I’ll be paying attention to in the radio mix when I listen back over the next few days. But perhaps the most important thing about this particular concert was how I left the hall feeling like I was part of the promming clan. Don’t get me wrong – there isn’t some kind of weird initiation ceremony – this was purely and simply to do with engaging in conversation with one or two familiar faces I’d seen repeatedly over the past few weeks. 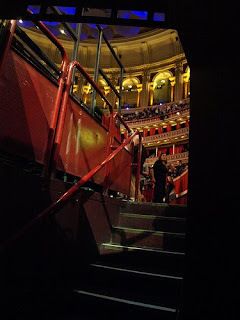 There’s a very special feeling to be had there and one which makes the Royal Albert Hall more than just a venue which hosts a series of concerts all summer long. The nicest moment came shortly before the beginning of the first half, however, when one prommer stood behind observing my attempts to pictures of myself with my SLR offered to take a picture of me with the orchestra in the background. A very nice gesture on his part and one I hope I look back on at the end of this year’s season with the same warm, fuzzy feeling I do now. I feel wretched. Tonight was a big night at the Royal Albert Hall and yet I failed to consume anymore than five or six minutes of the actual concert. I know. It’s no big deal really, is it? It happens to all of us. We all sit down in front of the TV and for one reason or another find ourselves distracted by something going on in the kitchen, the telephone ringing or an incoming SMS. In fairness, today has been a bit of a weird day. 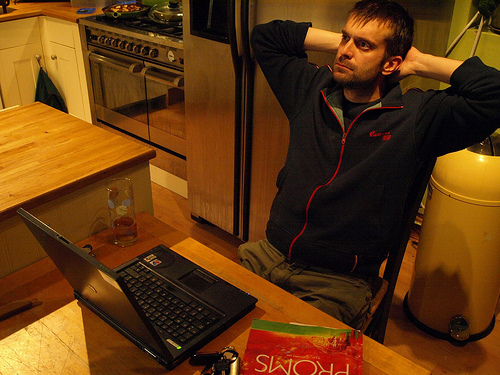 I didn’t intend to spend most of the day working from home. I’d hoped I’d do some work in the morning and making it to west London by 11.30am. My best laid plans ended up being a complete disaster however, almost as soon as I woke up this morning. I’ve been obsessing about some bizarre pains in my chest just recently. Am I drinking too much? Do I need to exercise more? Is day to day life getting me down just that little bit too much? Is the pain across my chest some kind of warning signal? The doctor at the neighbourhood surgery whose name I can’t and won’t even attempt to spell was suitably reassuring before proposing it might be a good idea for me to go to the nearby walk-in clinic for a series of blood tests. He was such a charming man, terribly effecient too. Despite his reassurances however, I have spent the entire day obsessing about what that chest pain might be. In between sneezing, snoozing a little and engaging in conversation with my mother about something she took a dislike too on TV recently, I only managed to get part way through the Haydn Concertante from tonight’s concert. I feel like a complete let down as a result. Call youself a Proms fan Jacob? Surely you could have stayed the course for this important gig? Sadly not. I’m disappointed that for one reason or another tonight’s concert has passed me by. I’m banking on some free time tomorrow morning to catch up on what I missed. And if I manage to watch it back from the PVR, I promise I’ll report back. In the meantime, let me know what you think should you have an opinion when you listen via iPlayer. I loathe Berlioz’ Symphonie fantastique. The composer’s triumph of orchestration has been eclipsed by the work’s ubiquity. Everyone loves it. I hate that. In fact, I really wouldn’t be surprised if one fine day I trotted down to our nearby mini-mart to buy some milk only to discover it being pumped over the public address system in the foolish belief it will encourage people to spend more money. It won’t. It would only make me run out of the door throwing what I had originally considered purchasing down on the floor before I leave. I missed the first half of tonight’s prom. I swore out loud when I discovered the clock on the kitchen wall didn’t read half past seven. It wasn’t that I’d missed half a prom, more I’d missed the clarinet concerto. I did feel terribly dirty, like I’d callously snubbed a friend. I play the clarinet, you see. I’m always interested to hear clarinet stuff. Mind you, clarinet soloist Martin Frost got a massive cheer for his perky sounding encore. On that basis alone I will listen to the first half on iPlayer to catch up. As much as I didn’t want to listen to the Berlioz in the second half, I reckoned I ought to. The Symphonie Fantastique would have to be today’s fix. It’s a good symphony. I’ve played it and enjoyed it. But there’s something inherent in it’s accessibility and it’s resulting popularity which has resulted it in almost acquiring the same status as Eine Kleine Nachtmusik. I was an idiot to think that, however. Gustavo Dudamel and the Gothenburg Symphony Orchestra did what was necessary to challenge the assumptions I had in my head. Not only that, I was reminded just how much more satisfying a live ambient broadcast of a symphony is over a dry, soulless studio recording. The crowd went wild – so much so that I wish I’d been there. And to repay the appreciative audience, Gustav and his merry band provided us with not one, but two encores. We feel so special when there are encores.